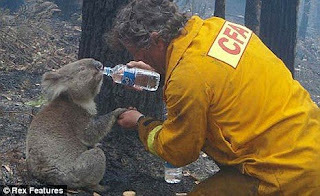 Mr. Koala Bear meet your new hero, David Tree, firefighter. My thoughts and prayers are with you Australia. Post Edit: it seems that Mr. Koala Bear is a she! A bit of good news, Ms. Koala Bear has found love in the shelter with another koala bear...all together now...awwww. I saw this photo in the newspaper this morning then on the news -- it's just amazing. I've always loved koala bears but I've read they are not the gentle creatures they appear to be -- but, whatever, they are adorable. My prayers are also with the folks dealing with the devastation of the fire. What a great photo! It just makes you want to cry. Many prayers to those in Austraila. What a great photo-it sure tugs on the heart strings. Being an Australian I understand the magnitude of this photo. These are wild animals and you cannot touch them in the wild as they can be very dangerous. It is very hard to watch any news at the moment witout the tears flowing as so many of our fellow Aussies are suffering so badly. Australians need the prayers & thoughts of people like yourselves from around the world. In times of tragedy it can be the gift of hope to know that others are thinking of you with love and support. The loss of human life, wildlife, pets & livestock is just heartbreaking, you cannot but cry with the many stories of devastation & courage. My heart goes out to our Victorian neighbours who have lost loved ones, homes & businesses. That picture is amazing. How thirty that poor little girl must have been to come so close to a human and drink from his bottle! My prayers go out to everyone dealing with this great tragedy. I got goose bumps just looking at this photo, how lucky she was to have his help! SO cute! This puts a sweet face on a horrible tragedy.